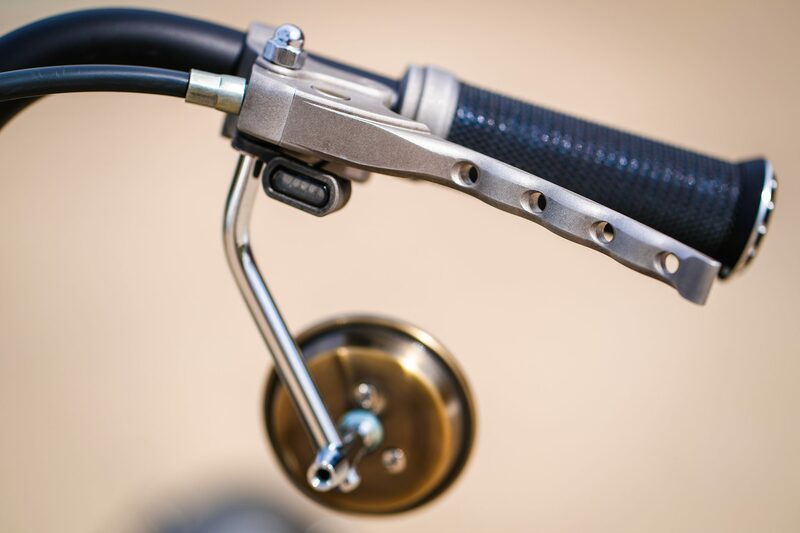 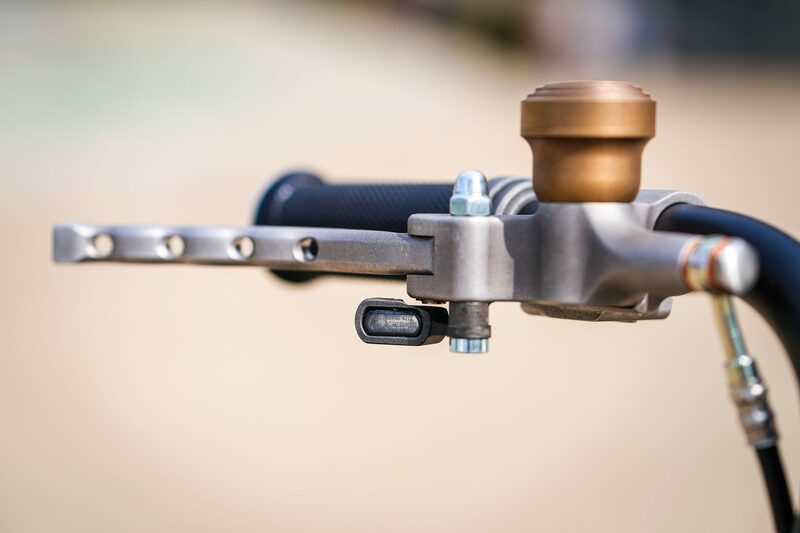 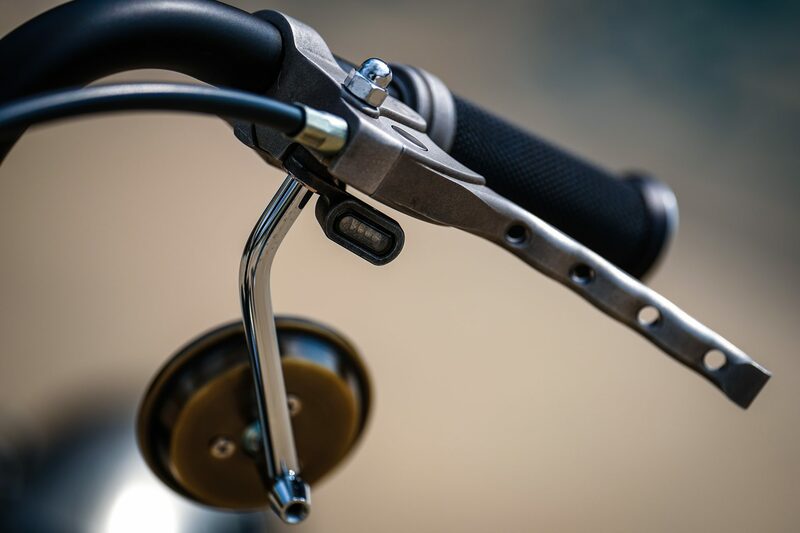 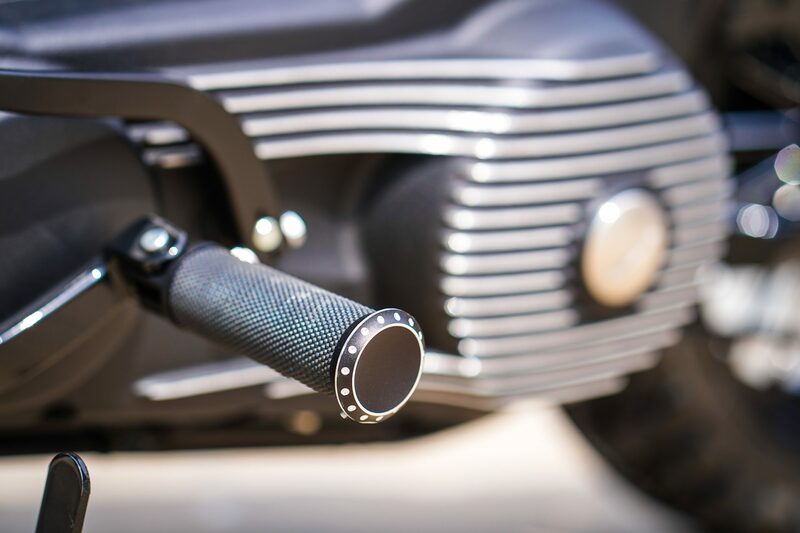 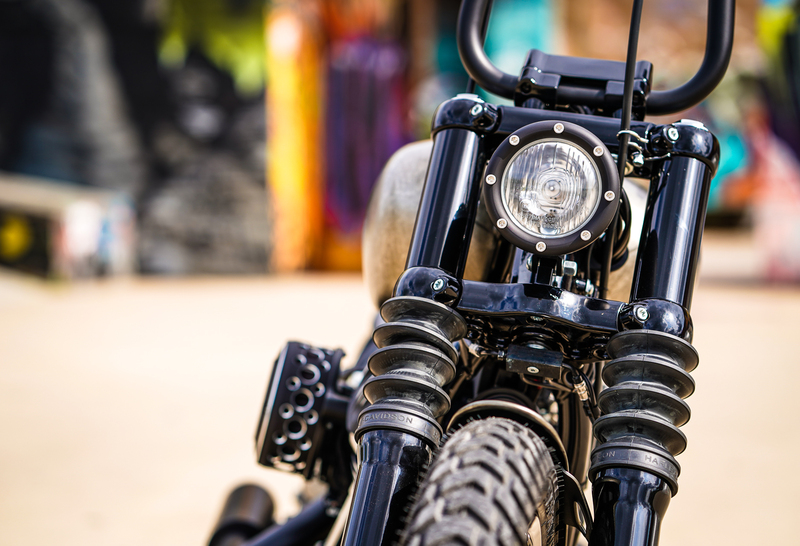 Introducing a “Bolt On and Ride” bike just at the end of the motorcycle season may seem a bit counterproductive – especially if you take the word “Ride” literally. 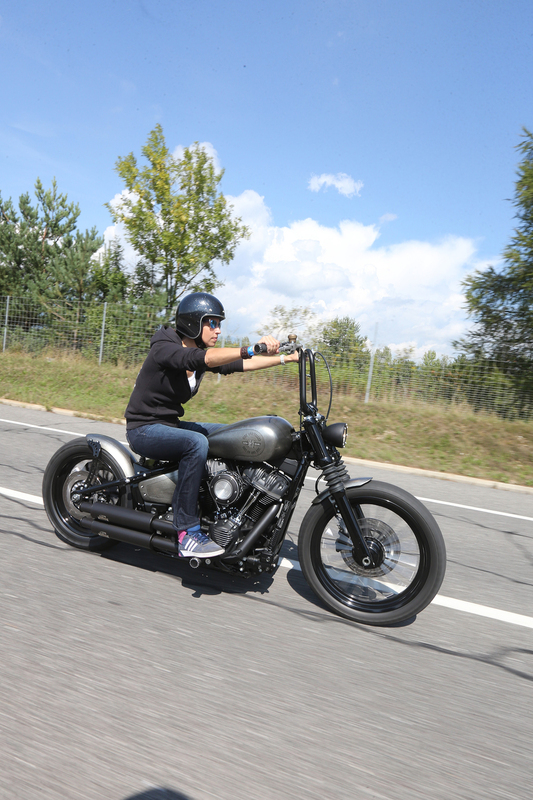 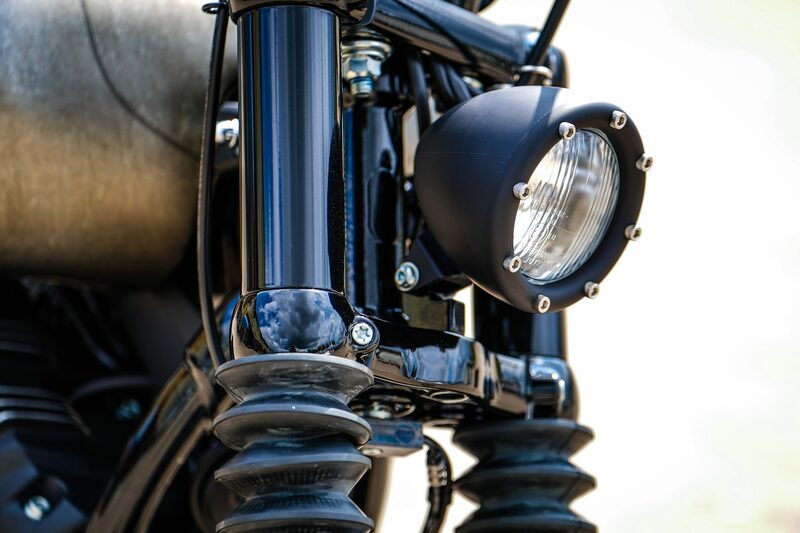 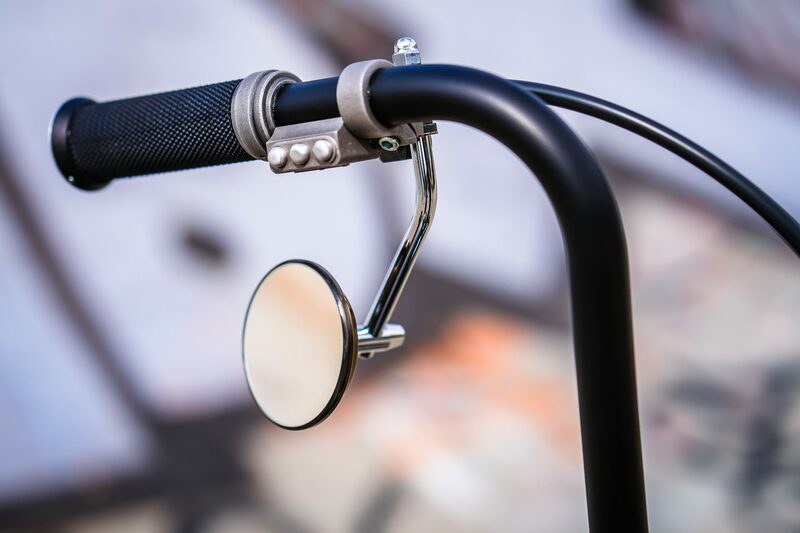 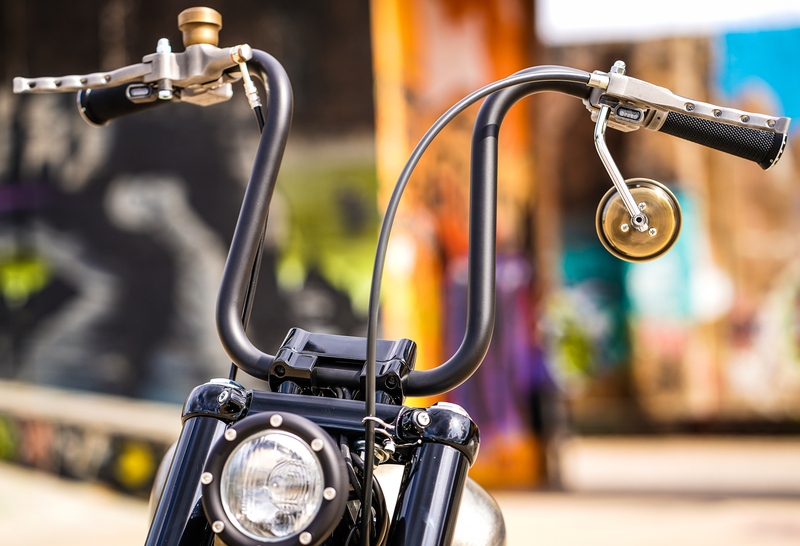 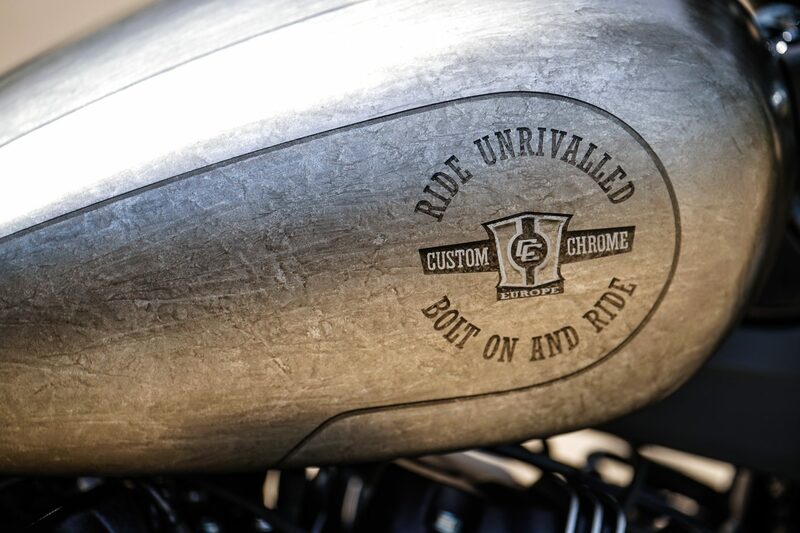 But the motorcycle season at Custom Chrome Europe has always lasted into autumn – and last but not least there’s a not-so-unimportant season: customizing over the fall, winter and spring months. 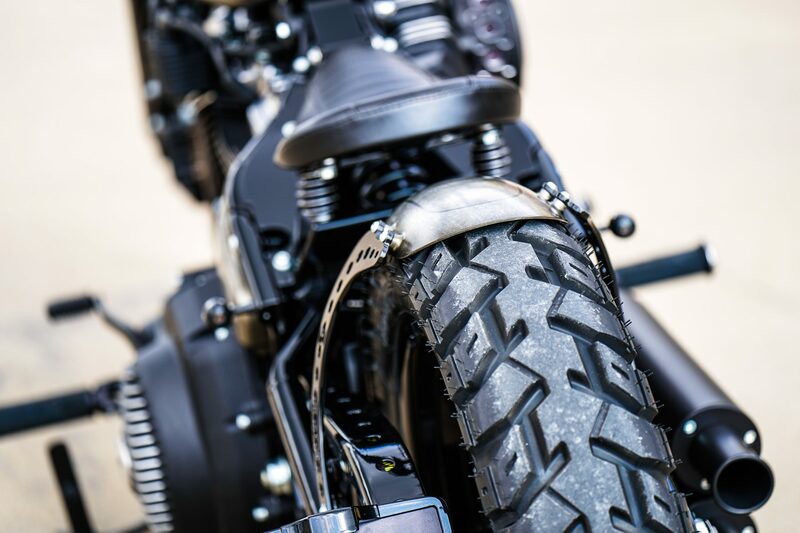 They like to show the latest parts on a complete motorcycle, especially if it is such a successful setup as the “Cross Bob” built by the longtime CCE partner Thunderbike in Hamminkeln. 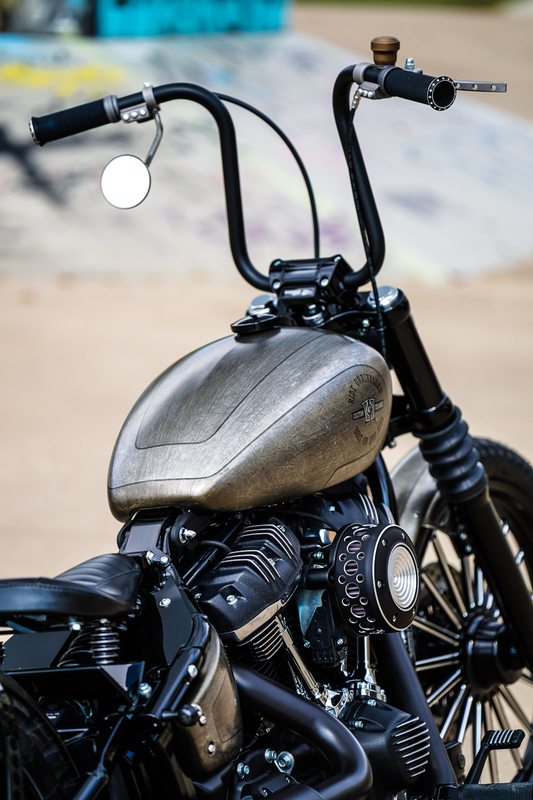 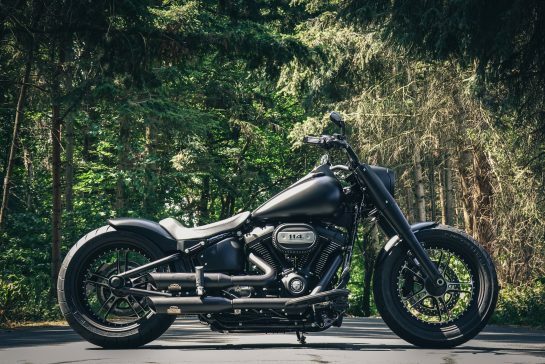 Because it’s based on one of the newest Harley models, the 2018 FXBB “Street Bob”. 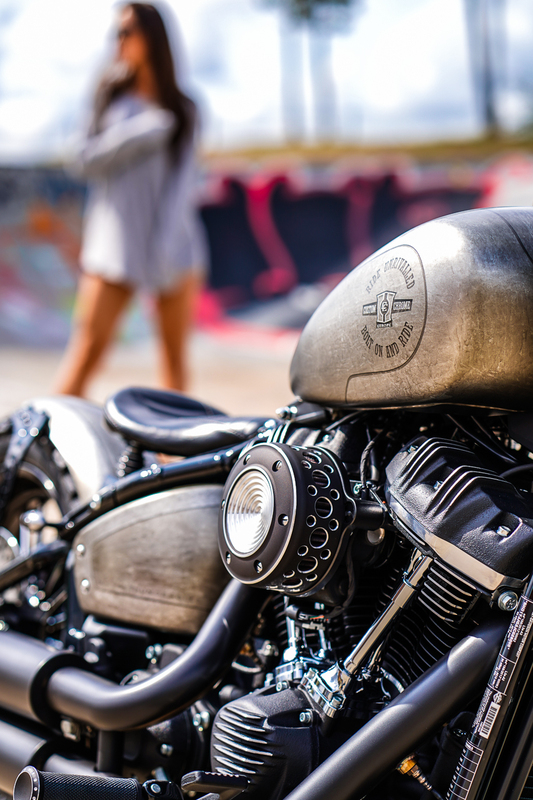 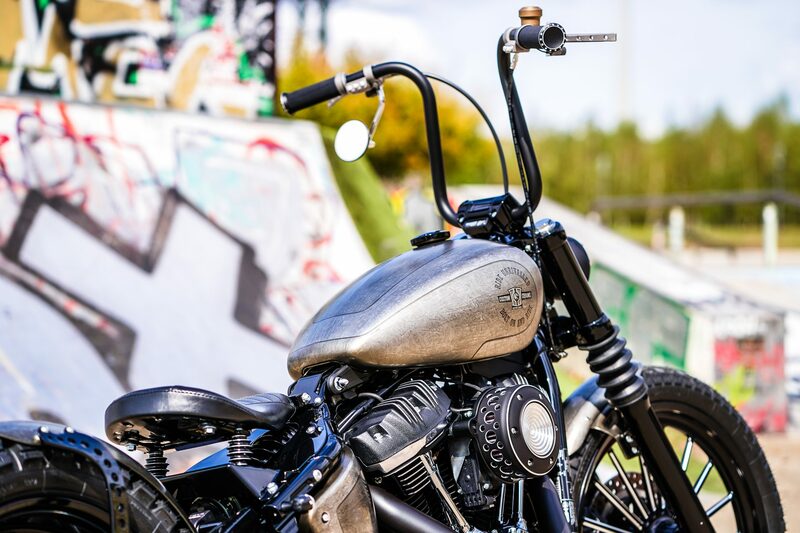 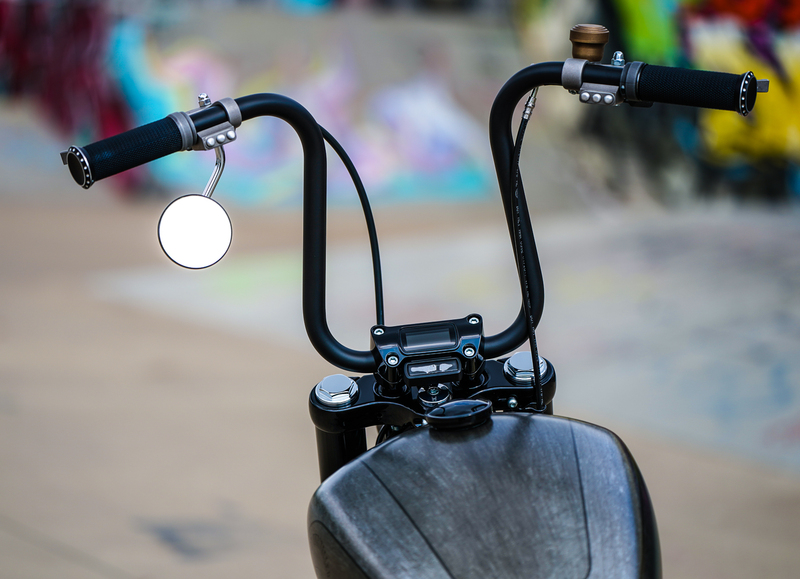 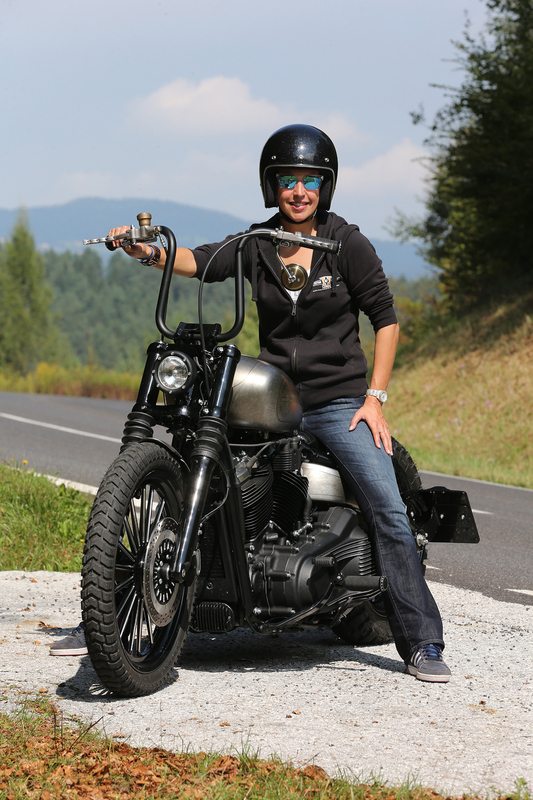 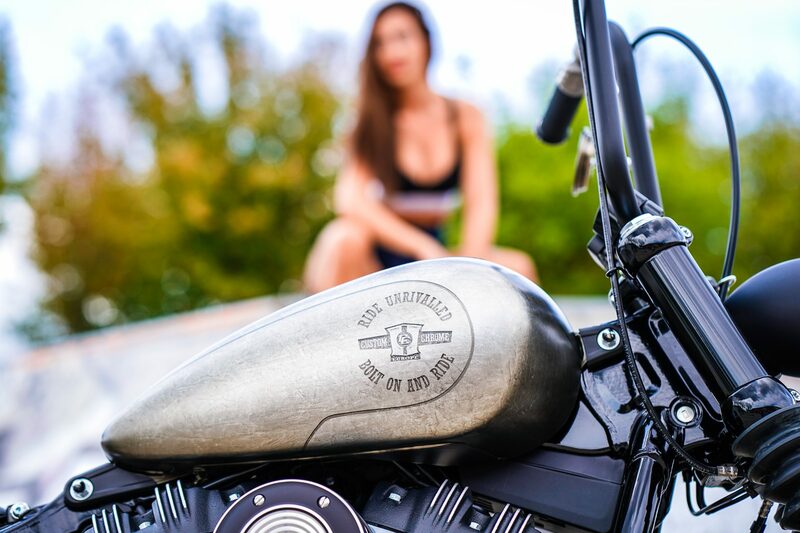 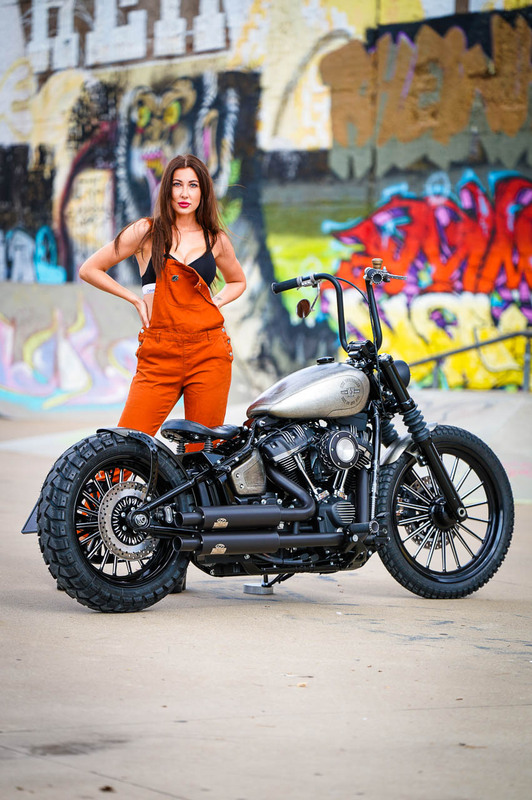 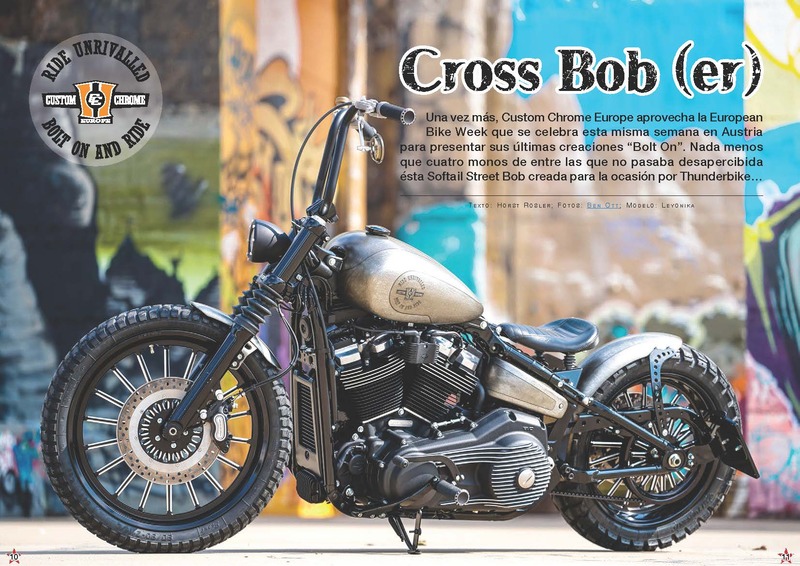 The “Cross Bob” premiered at the 2018 edition of European Bike Week: While Harley-Davidson presented their latest Milwaukee-Eight powered piece of jewelery at the Harley-Village, CCE unveiled its newest piece of jewelry at the Arneitz Custom Show on September 3rd. 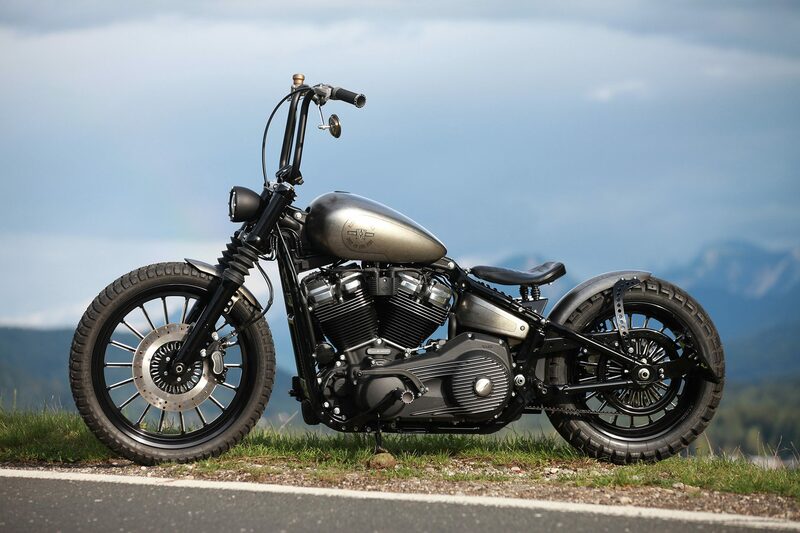 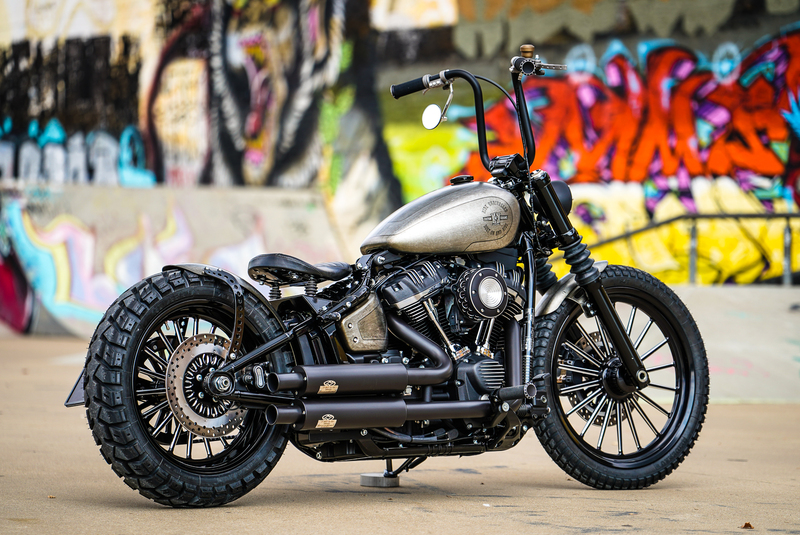 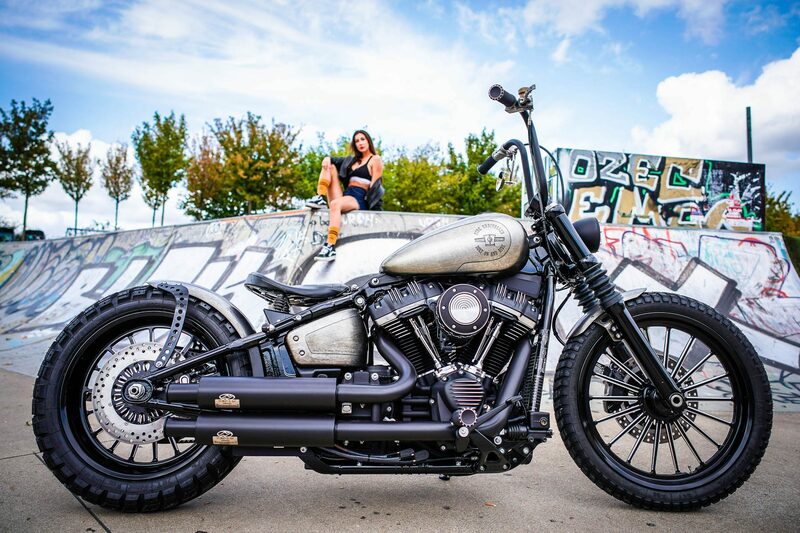 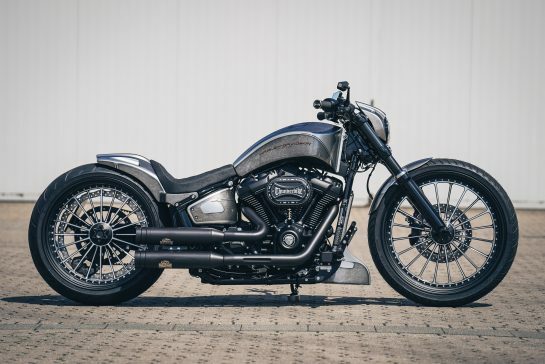 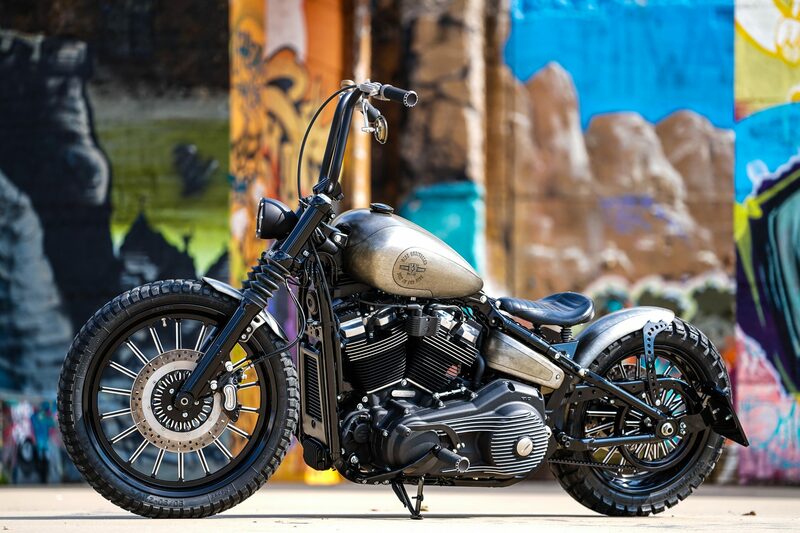 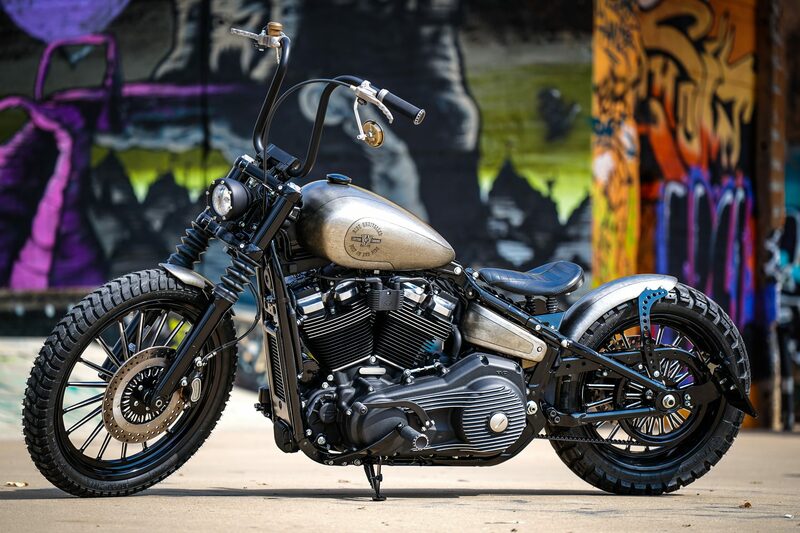 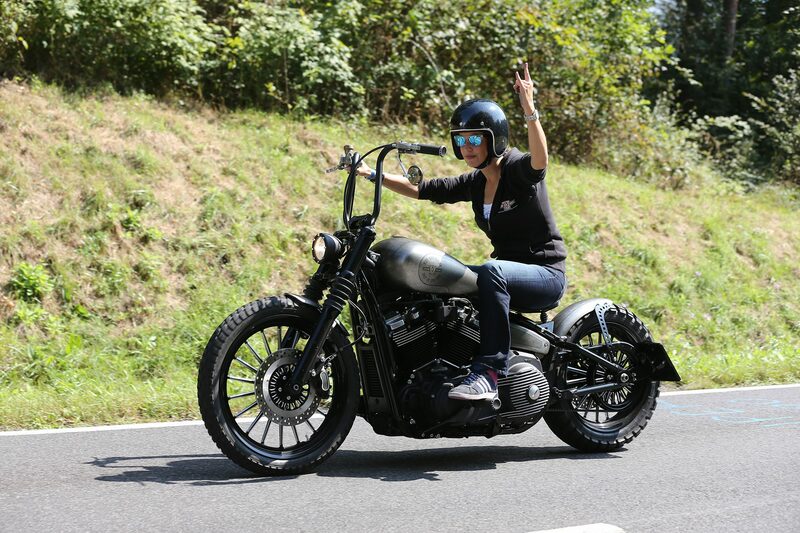 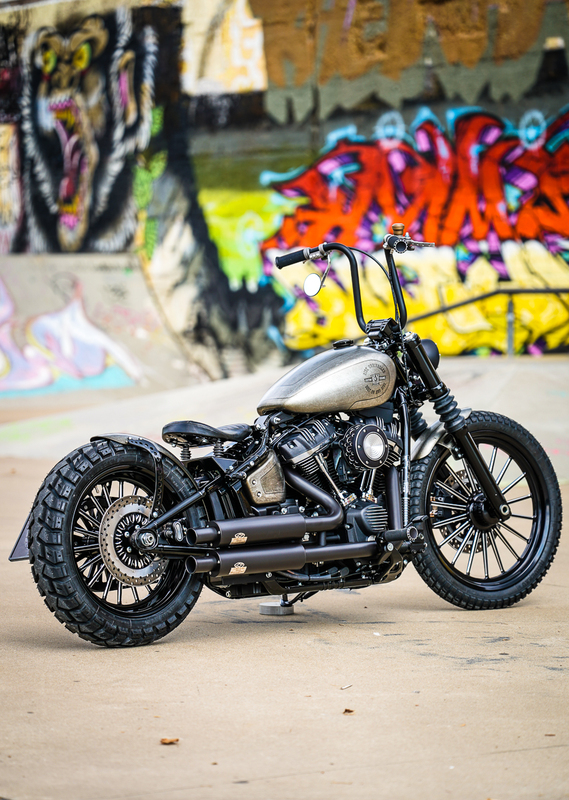 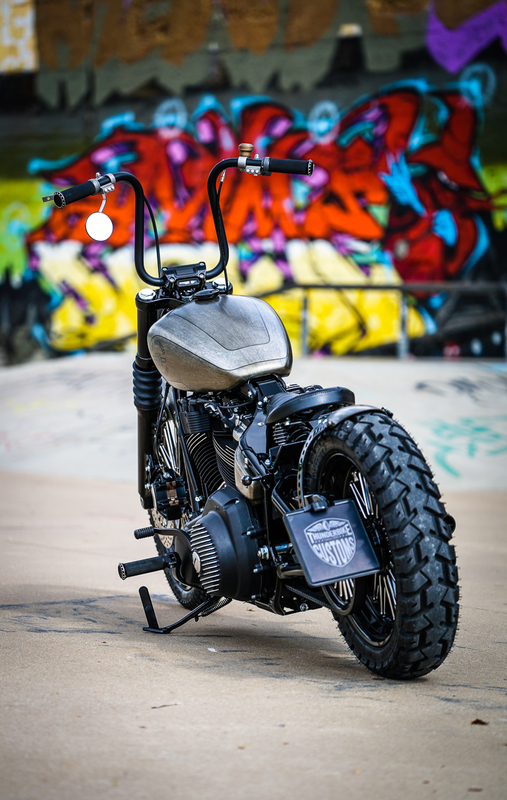 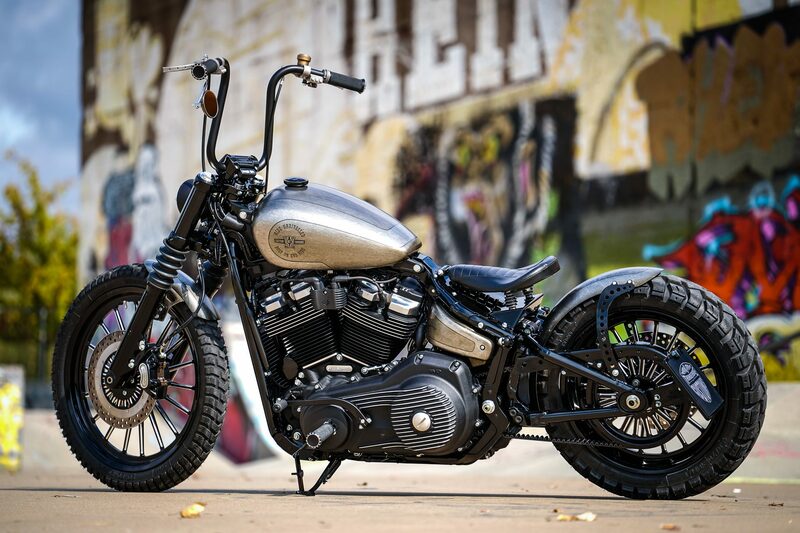 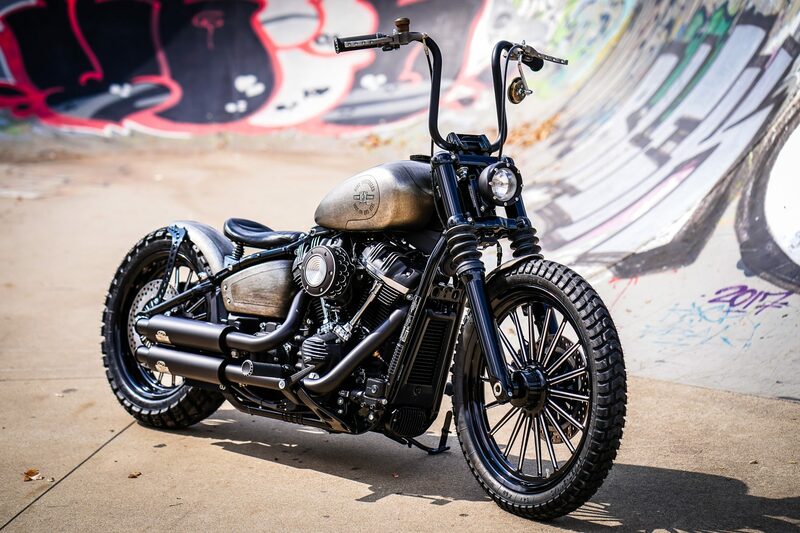 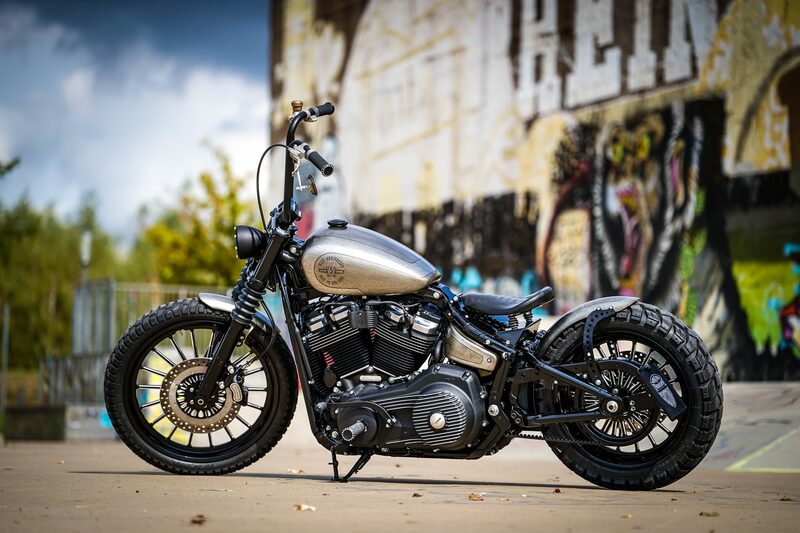 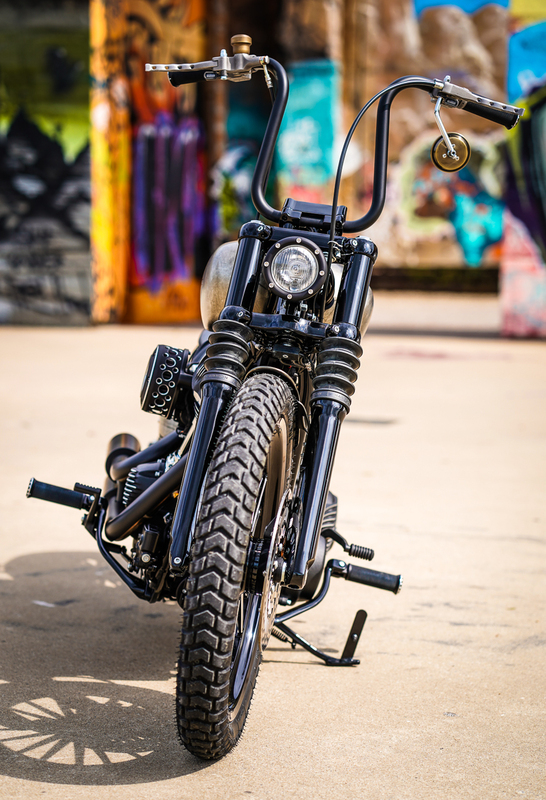 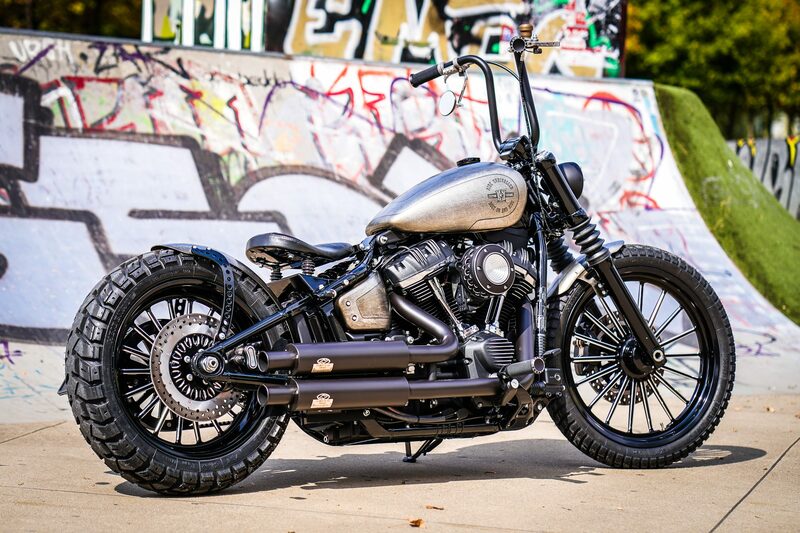 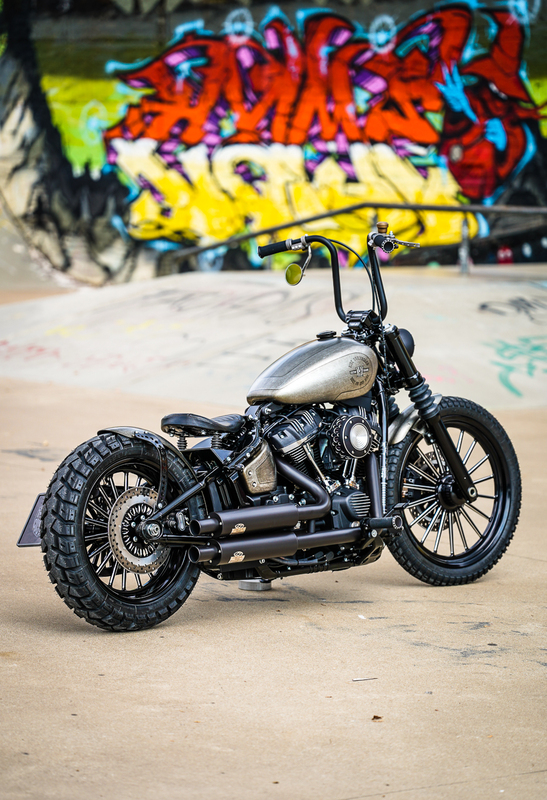 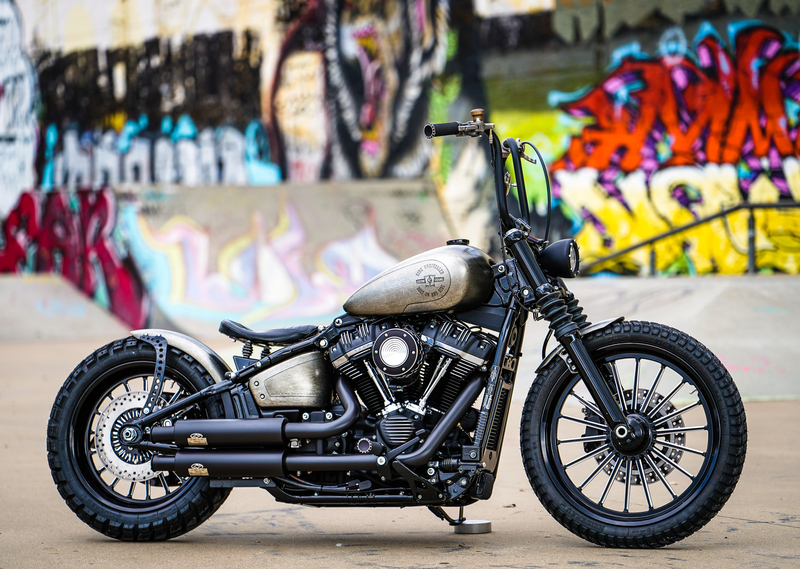 A “New School” Bobber at its best! 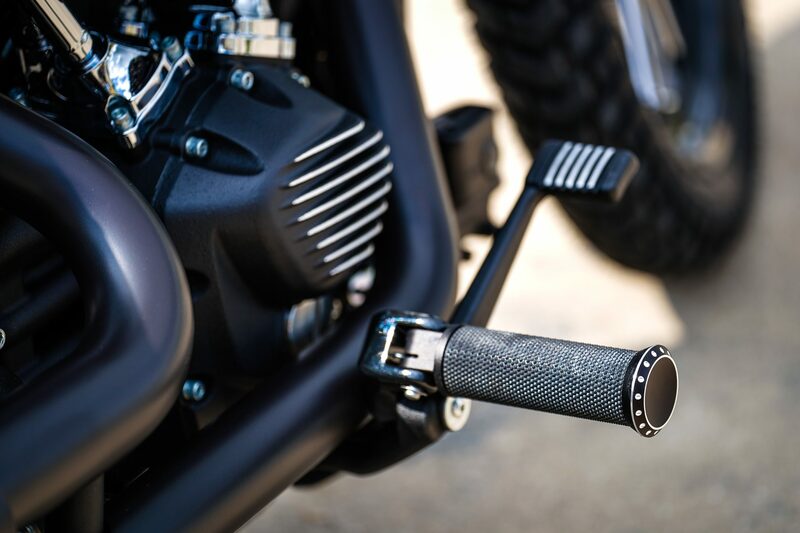 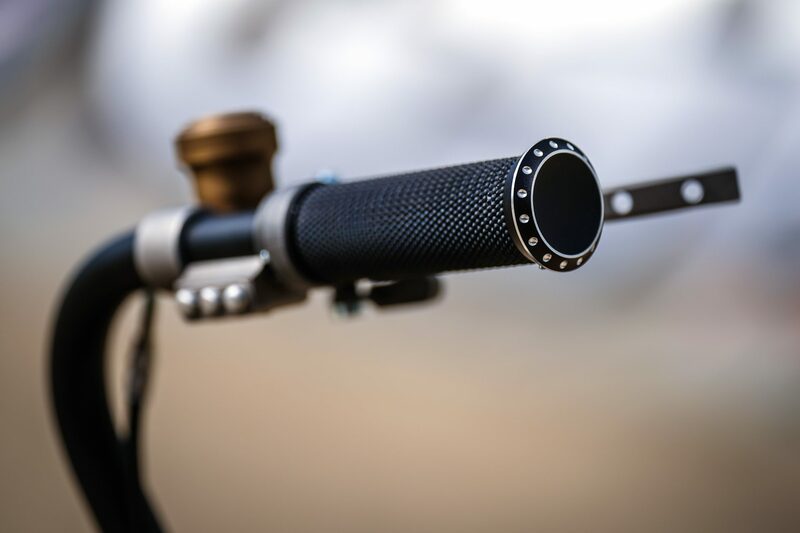 The parts list is long and contains prominent names, which makes it hard to be brief: The invisible core of the suspension is the new lowering kit from Müller Motorcycles, which allows the suspension to be lowered to 35 mm, for show purposes even 40 mm! 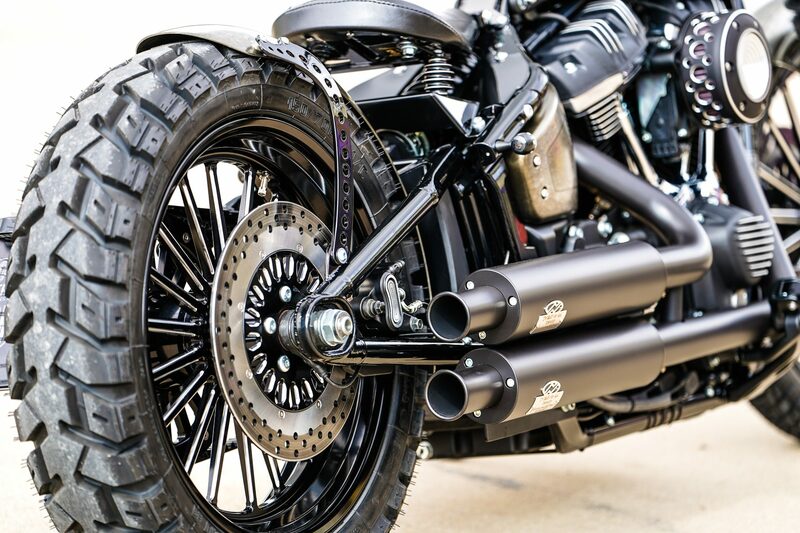 Thunderbike quickly followed with a front fork lowering kit, further downsizing the seating position of the new Softail suspension! 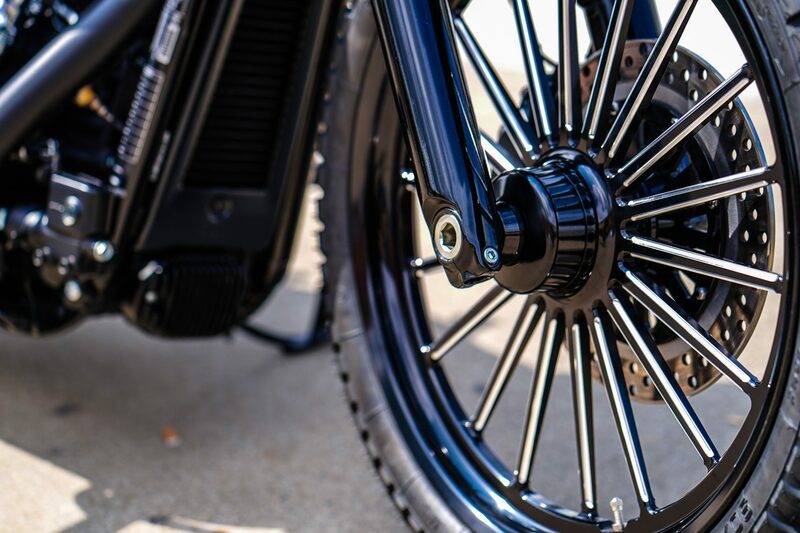 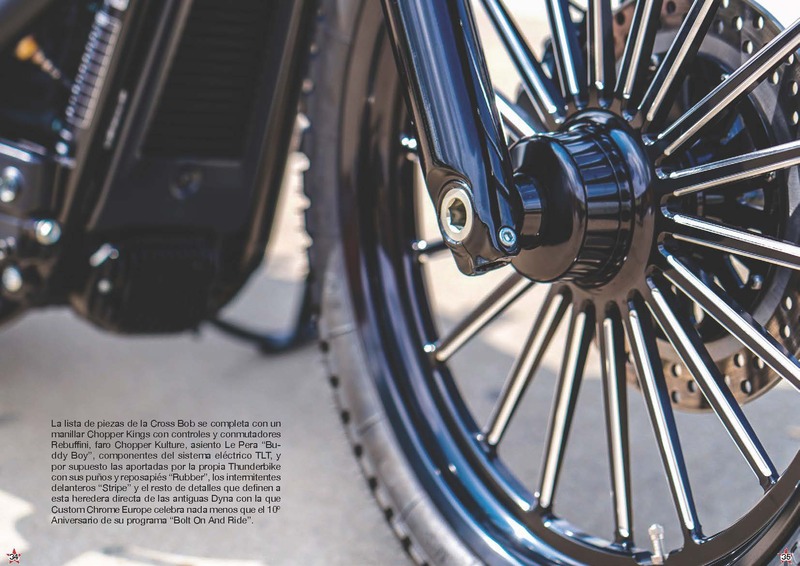 For a filigree “New School” look, CCE donated a set of RevTech “Nitro Black” design wheels, of course with matching brake discs and drive pulley – the selected radical tires with Heidenau K60 Scout tires in the lug profile provide the “Cross Over” touch. 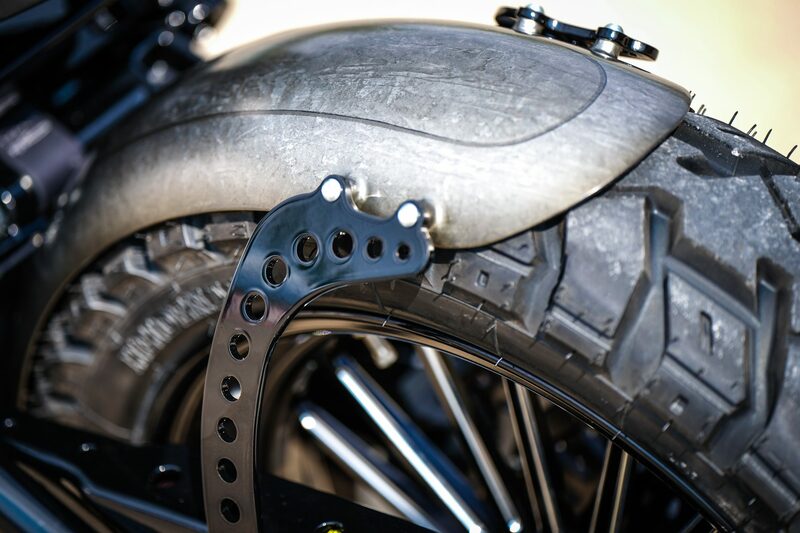 The fenders over the two rubbers are “Heavy Metal” by TXT, already finished with the new M8 Softails. 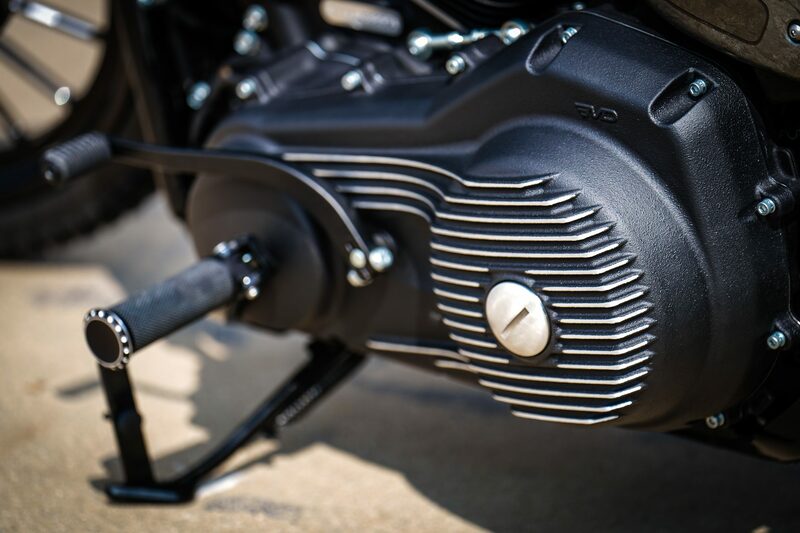 The Milwaukee Eight propulsion unit has been completely covered with new EMD covers – also current novelties – and Thunderbike’s “Grand Classic” air filter fits perfectly to the theme. 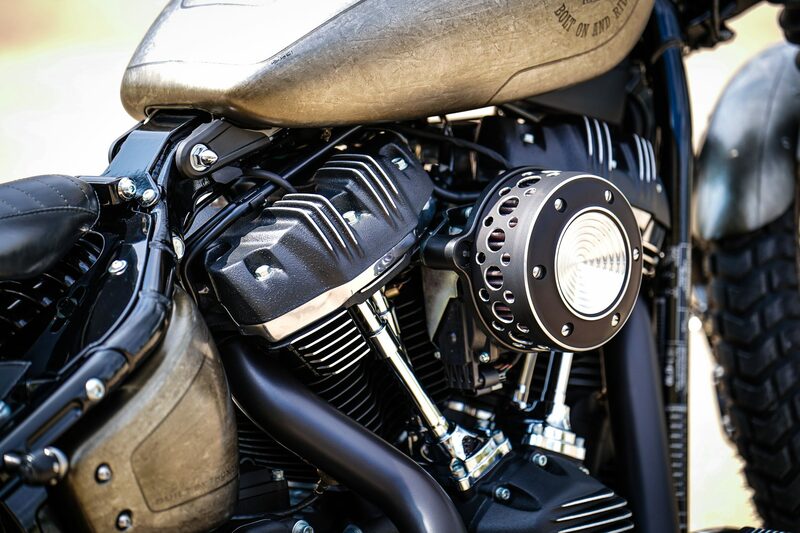 With the Dr. Jekill & Mr. Hyde equipment, the sound of the new M8 engine comes into its own – and the systems have been homologated since the launch of the M8 Touring models. 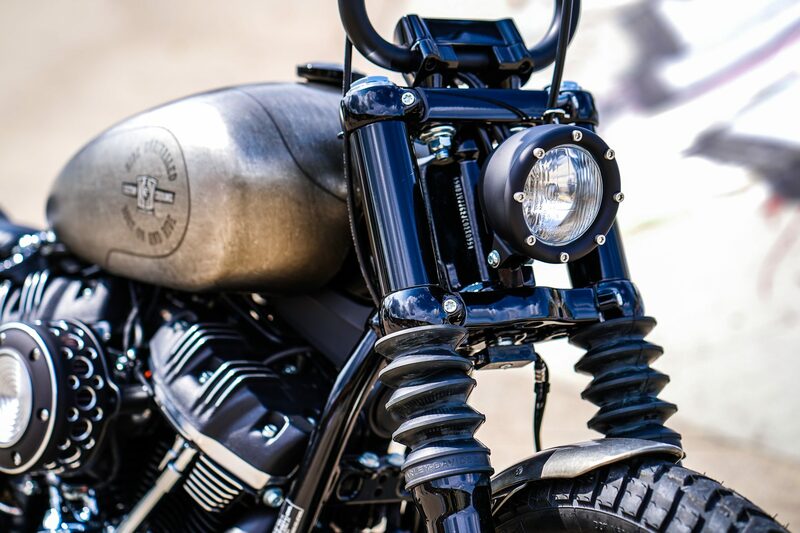 The conversion shows new parts of Chopper Kings (handlebars), Rebuffini (hydraulic cylinders and switches), Chopper Kulture (headlights), LePera (seat), Hell’s Kitchen (rear turn signal), TLT (electric box for CAN-BUS adaptation) – and of course Thunderbike , from whose extensive program rest system, side license plate carrier, Gabelverkleidung and many other details originate. 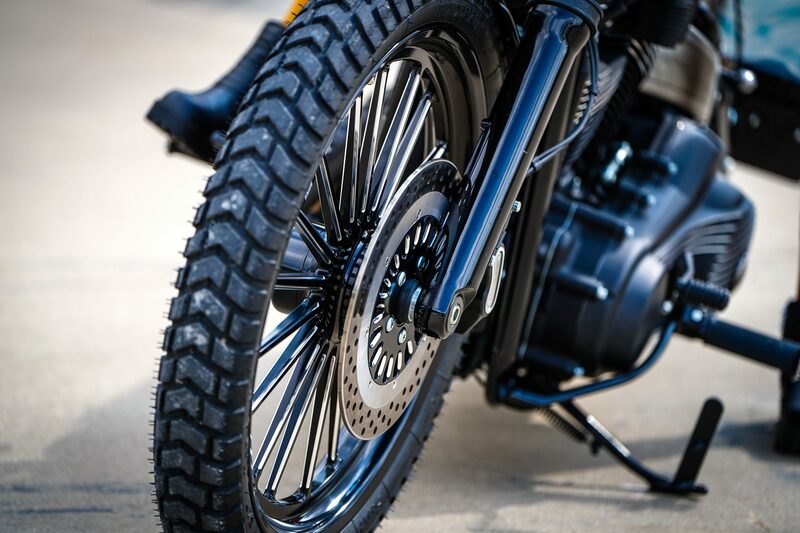 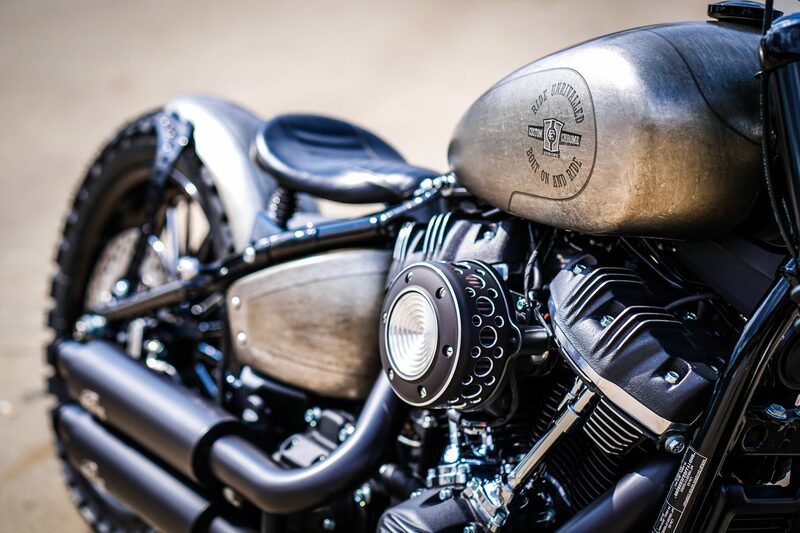 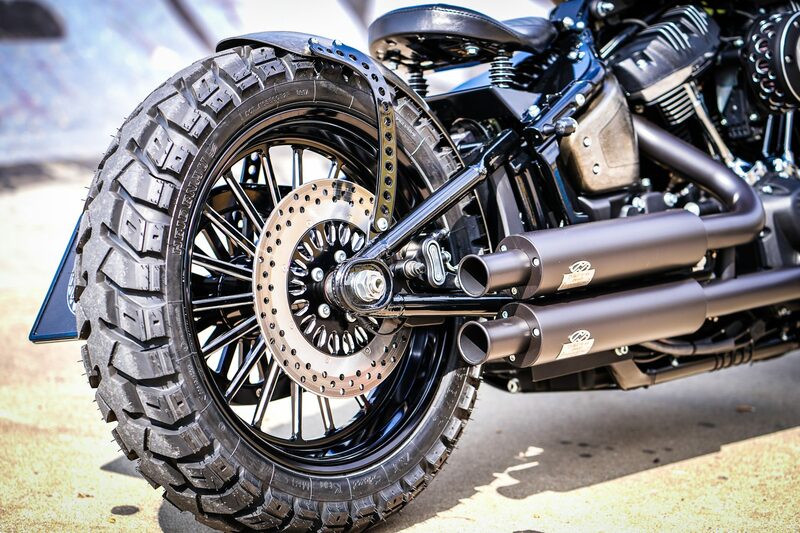 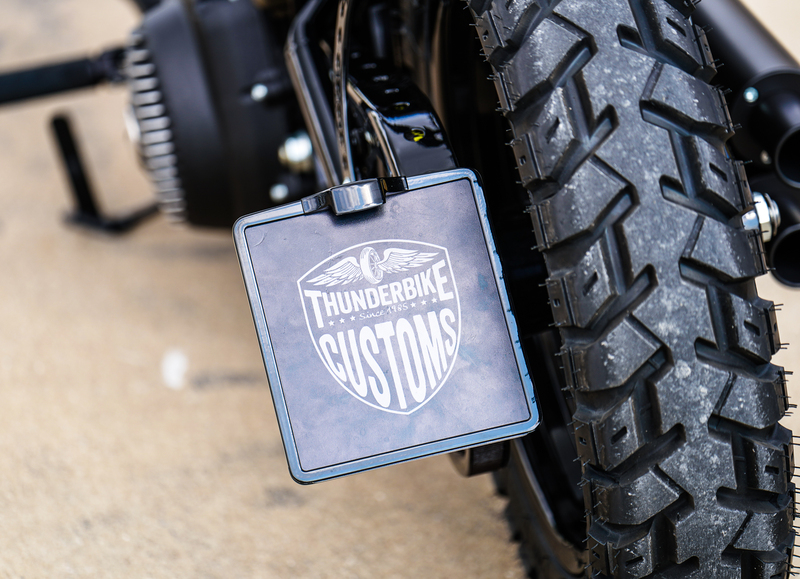 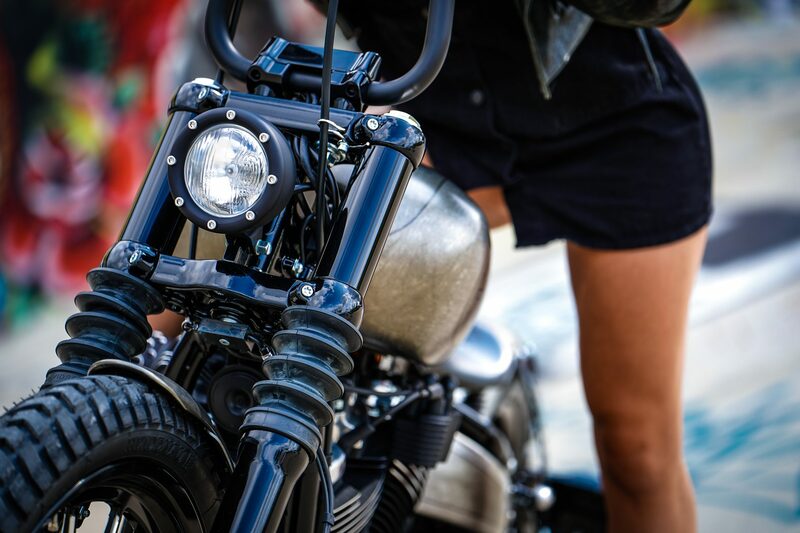 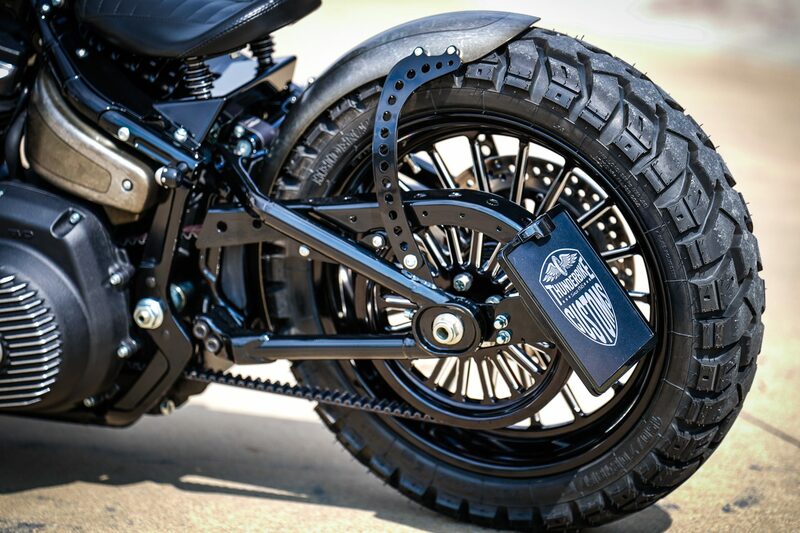 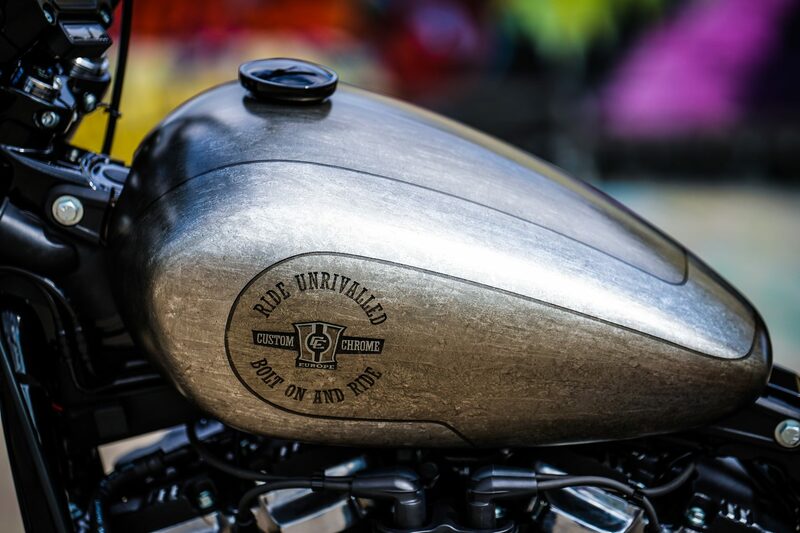 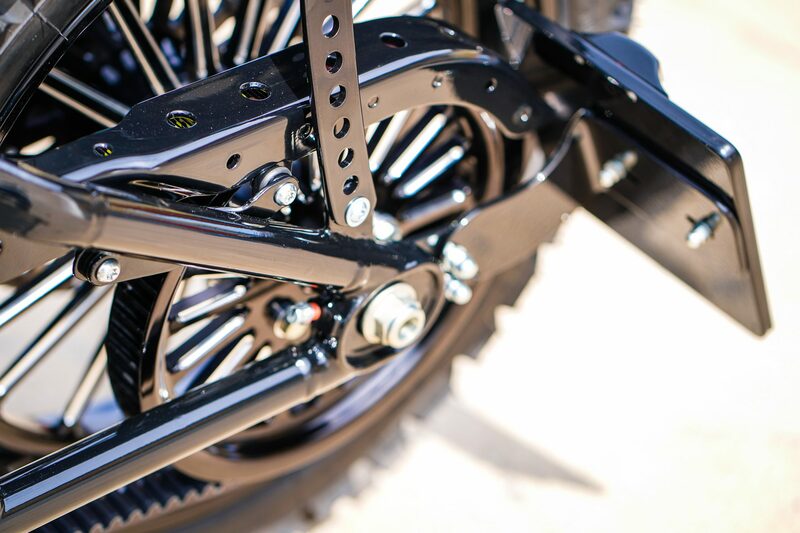 Thunderbike Parts and original Harley-Davidson Parts can be found in our Online Shop. 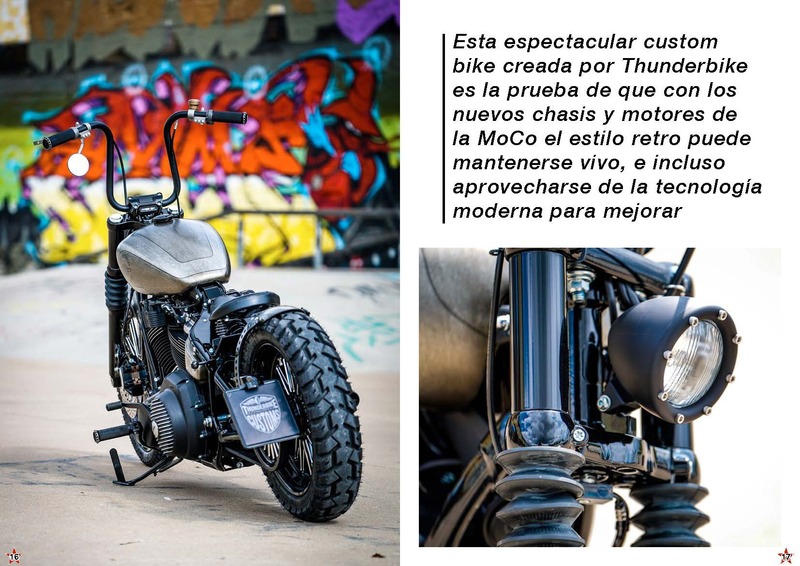 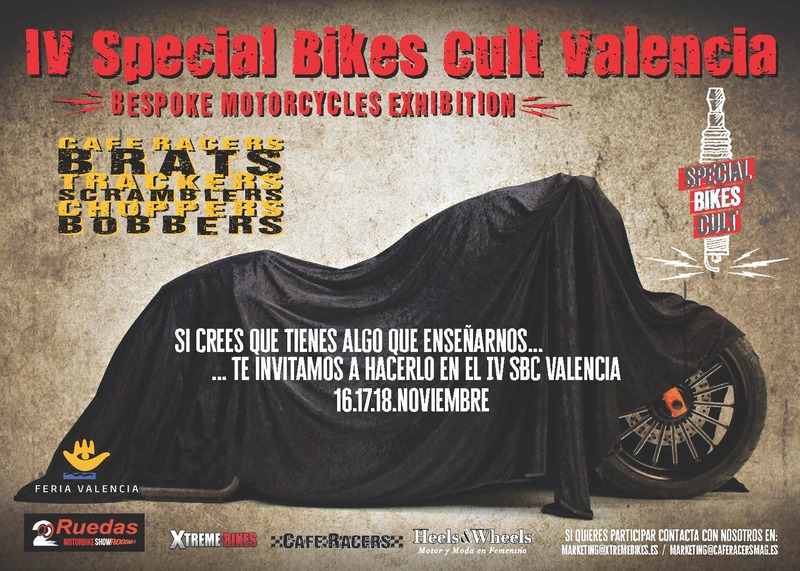 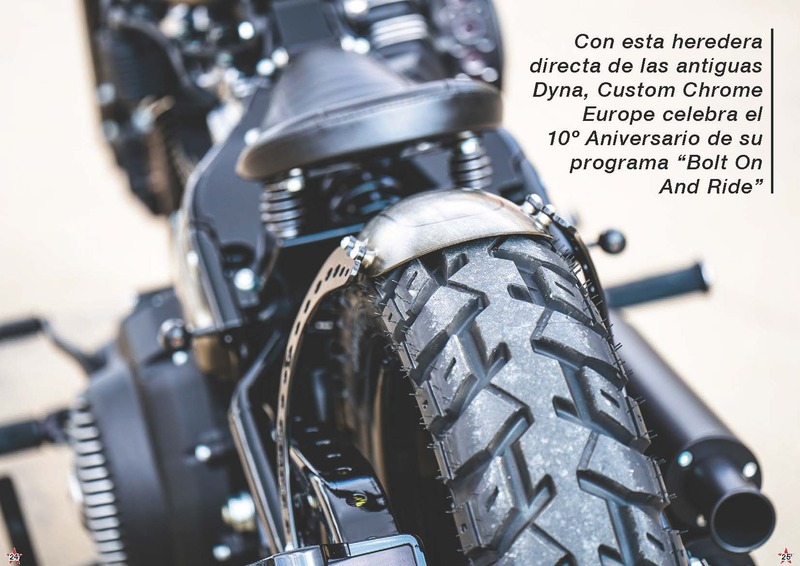 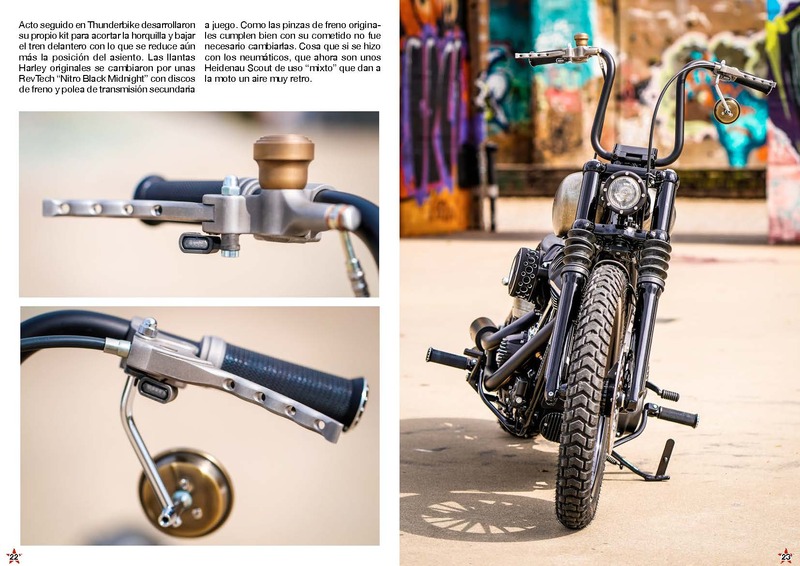 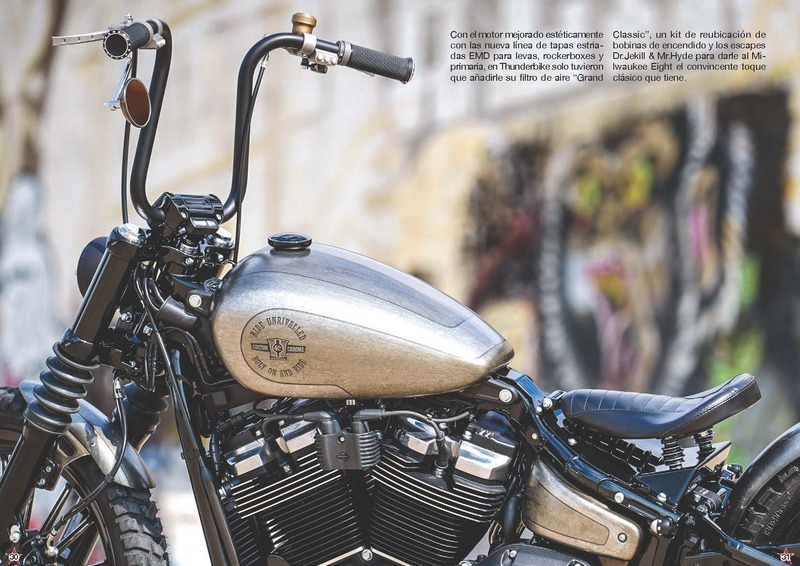 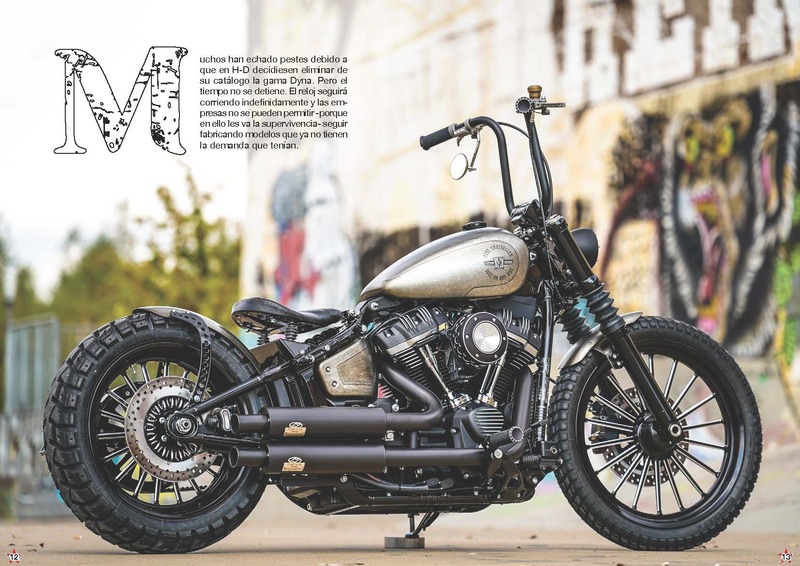 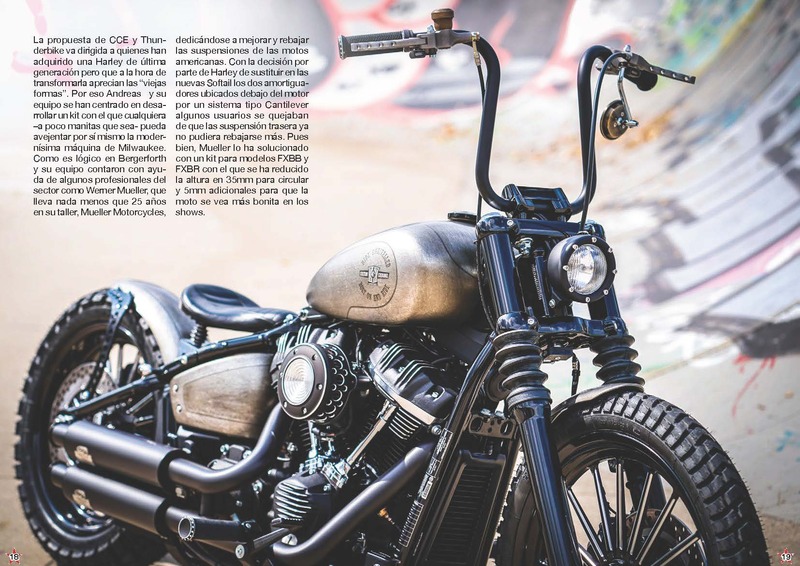 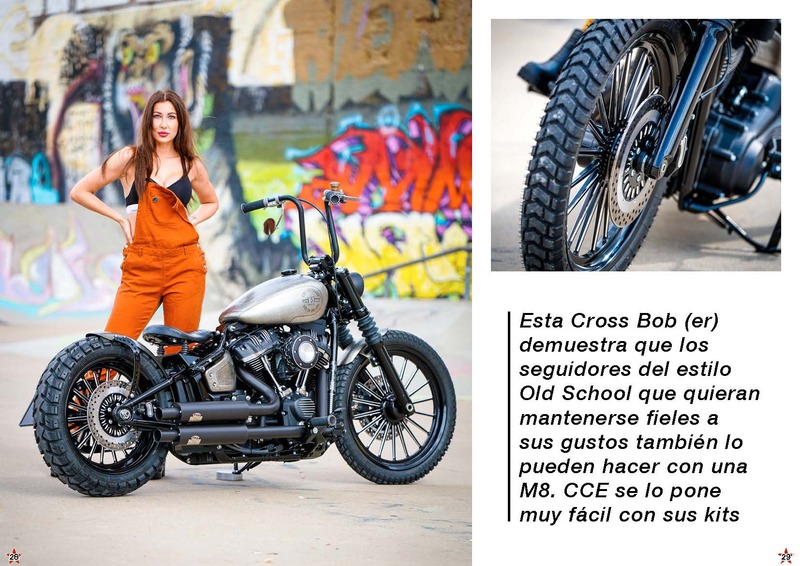 Our custom Chrome Project Bike Cross Bob can be found in the 57th edition of the Spanish Extreme Bikes magazine! 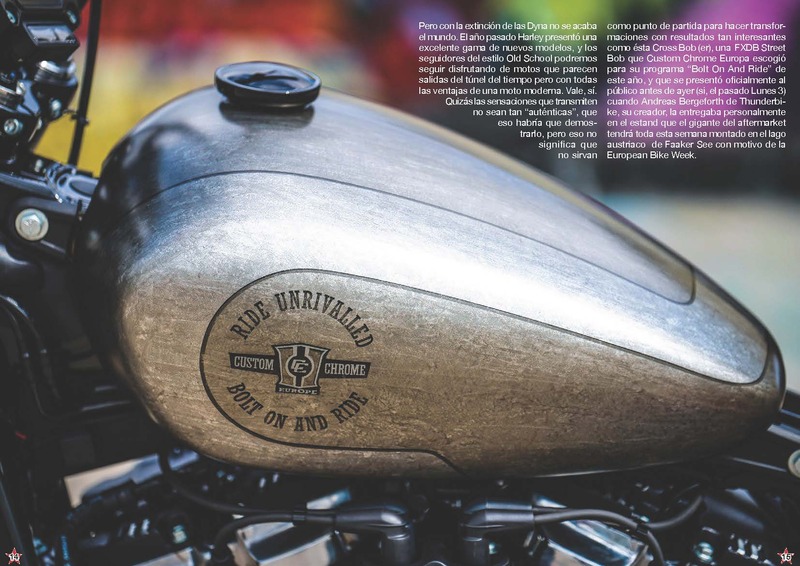 Information about the magazine can be found here.